Canberra PCYC has this week delivered three ‘Healthy Relationships’ school assemblies across the ACT in a first for the Territory. 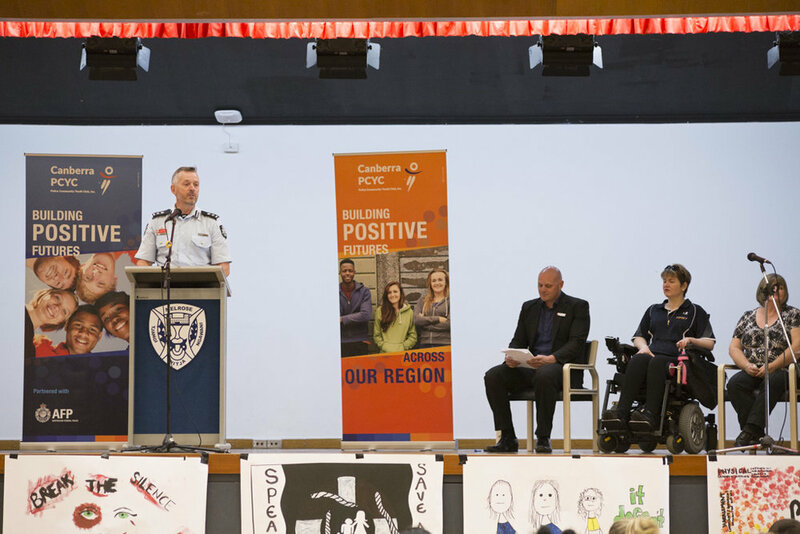 Funded by ACT Policing and the Australian Federal Police Association, the whole-school assemblies deliver a powerful message on the impacts of relationship violence and the importance of seeking help. Harrison, Melrose and Wanniassa high schools have participated in the initiative. The guest of honour and main presenter Anjela ‘Anj’ Barker (Young Australian of the Year 2011 (VIC)), was brutally assaulted by her boyfriend when she was sixteen years of age. Since the attack, Anj has been confined to a wheelchair and requires a computer to speak for sustained periods of time. Anj is committed to sharing her story and promoting safe relationships. The Victorian Government made the documentary ‘He Loves Me He Loves Me Not’ based on the attack and Anj’s recovery. This video is also used across Australia as part of the ‘Loves Bites Program’. The assemblies also included speakers from police, government and community services, including Deputy Chief Minister Yvette Berry MLA, Joy Burch MLA, Michael Pettersson MLA, Giulia Jones MLA, Nicole Lawder MLA and Elizabeth Kikkert MLA. ACT Policing Superintendent Robert Wilson and Station Sergeant Chris Meagher brought a police perspective to the statistics on domestic and family violence, encouraging young people to seek support if they experience violence. The assemblies also featured speeches from Victims of Crime Commissioner John Hinchey and White Ribbon Ambassadors. The first round of the ‘Healthy Relationships’ school assemblies will conclude at Wanniassa high school today, and include a Canberra PCYC barbeque for all students.